This first edition (9780778801634) is replaced by the second edition (9780778804512). Communicate with babies -- even before they can speak. Before a baby can talk and before a toddler can say completely understandable words, they have important things to say. Babies and children are often more interested in connecting with parents or other caregivers than playing with their toys. The Baby Signing Book uses American Sign Language, which is ideal for babies and toddlers because: The ability of babies to understand what they see develops well before their ability to understand what they hear. The ability of a baby to speak develops between the ages of 12 and 18 months, while the ability to use American Sign Language develops between 6 and 12 months. Babies understand what they see much earlier than typically expected, and are able to sign well before they are able to talk. 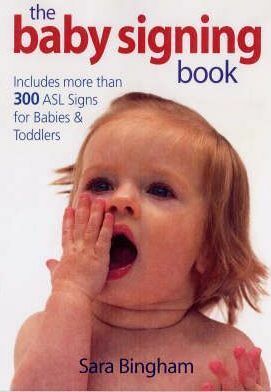 The Baby Signing Book teaches parents 300 developmentally appropriate American Sign Language signs. With clear instructions for every sign, memory aid, song and game, the learning in this program is easy to follow and, most important, fun for all. Language milestones are charted throughout the book so progress can be charted. The book also features a variety of visual highlights that emphasize key concepts and interesting tips. Adults can customize a program according to the family's needs and aspirations. With the dictionary of 300 symbols, this handbook is clearly the most user-friendly and comprehensive baby signing book available.